Rubem Robierb. This is the artist’s first Houston exhibition. Robierb is best known for his vibrantly colored images that combine South American-Miami style with a hard New York edge. His unique working style incorporates richly layered screen-printing, hand and spray painting, diamond dust, and new non-traditional mediums such as neon signs. In this exhibition, Robierb playfully juxtaposes cultural references, while exploring socio-cultural issues that define our current times, as exemplified in his HEART, Bullets and Butterflies, and Power Flowers series. Within the Bullets and Butterflies series, the Hybrid Butterfly has been divided into two identical, yet mirrored life-size paintings of each wing. The bullet, acting as the creature’s body, is materialized into a 37-inch tall aluminum bullet sculpture. With the wings being human-scale and the oversized bullet in between, it becomes a strong symbol of human-made power. The viewers can easily position themselves – both mentally and physically – between the two wings and feel the fragility of life through their interaction with the artwork as they become both the bullet and the butterfly. The bullet itself, encrusted in Swarovski crystals, underlines humankind’s desirability and glamorization of the bullet – even through it is one of the most deadly objects. 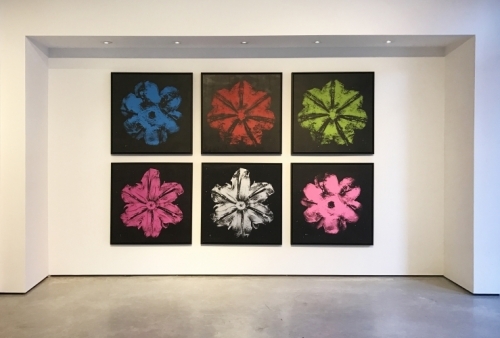 In Robierb’s Power Flowers, he is connecting his own narrative of bullets and war, with Andy Warhol’s iconic “Flower” paintings. Upon close inspection, the presumed Warhol flower is not a flower at all – it is a bullet that has been shot from a gun and has exploded. The merely “pretty picture” is corrupted and the optical truth of the artwork is revealed. Robierb’s work makes the viewer consciously aware of how violence and war corrupts your vision. The works contemplate the juxtaposition of how beautiful and sad our “pop-war culture” has become.